Think of the market as a journey on a rugged road and you, the driver, trying navigating, negotiating curvy roads and steep ascents & descents with only a shredded map (TA) giving you the occasional glimpse of what’s next. 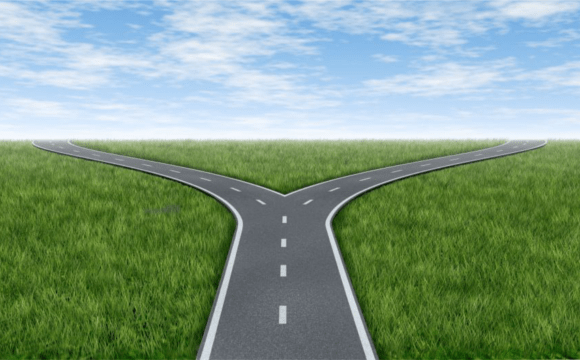 And sometimes you come to a crossroads and you need to figure out the next big direction to take, any misjudgment could throw you wildly off course. Over the weekend I mentioned that an oversold market into the FOMC meeting might be a dream set-up for catching some nice upside action into year end. Monday’s aggressive bounce brought that temporarily into question, yet yesterday’s action leaves us with exactly that set-up into the meeting. Markets have been down 10 out of the past 13 trading days & the $VIX was heading to overbought in yesterday’s action giving us a nice $VIX short trade with a 66% gain. $ES action was choppy and I manage to eek out a 1 point gain to flatten out for the day with $15 $VIX lottery puts still in play. 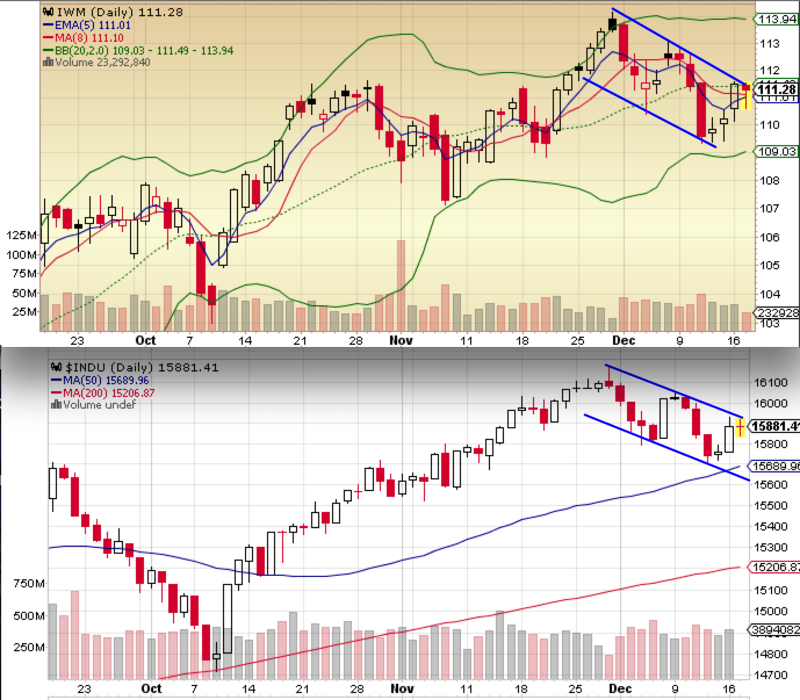 Bull flags in $DJIA and $IWM. Given the oversold conditions these look powerful and ready to rock at least into re-testing highs and possibly much higher. $IWM in particular is ready to push through the TL in the 111.50 area. It is also clearly possible that these indexes may revisit the bottoms of these flags, but I suspect we will have clarity on this sometime today. Then we have the $NYSI. Very clearly oversold. While not a precise timing indicator it gives you a clear picture where we are in the big scheme of things and it’s not an area where establishing new swing short positions has worked out particularly well in the past. While lower prices are possible it is an area where you want to look to buy. Bottom line markets are clearly not overbought here. 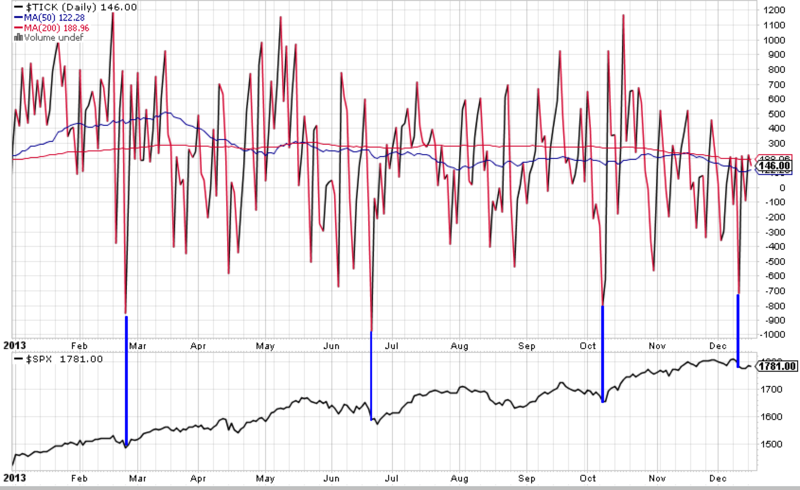 The recent $TICKS low reading remains of interest as well. I’ve marked the recent extreme low readings coinciding with a market low either immediately or shortly thereafter. 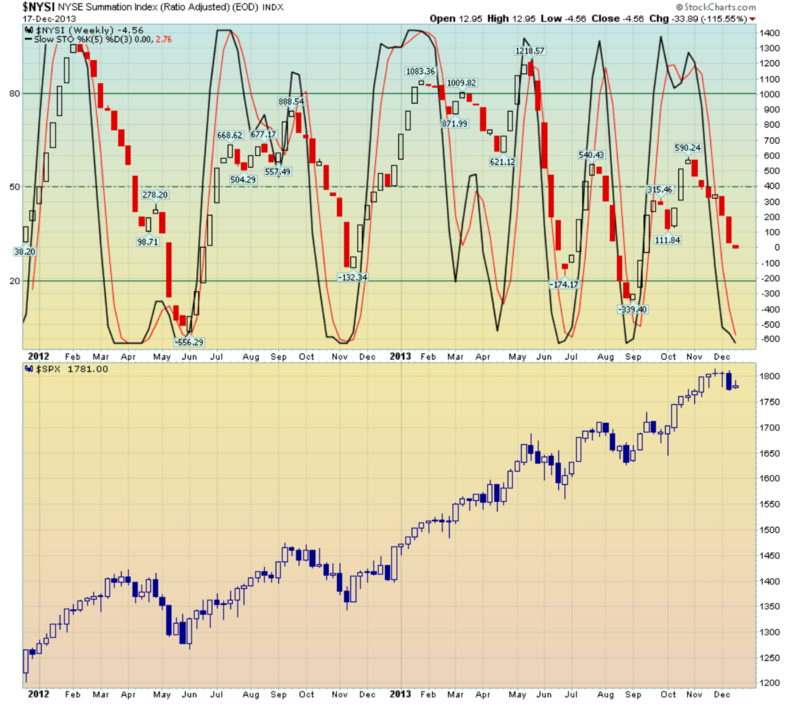 We are now in the latter situation leaving us with a higher probability of a sustained bounce. But note this signal is running out of time rapidly which is not surprising given the wait and see attitude of the market ahead of the FOMC meeting. For balance now a couple of signs that indicate further downside is still a very distinct possibility. First the CPC ratio is still completely complacent, I see no real fear spike here. In yesterday’s decline action I did not observe any particular imbalance in favor of puts either. If anything, the market seems almost neutral here in this regard. Not something I like to see for a solid bottom frankly. The other chart is the $VIX itself. Yes it provided a nice short set-up yesterday based on a 5th consecutive day up into the daily Bollinger Band. 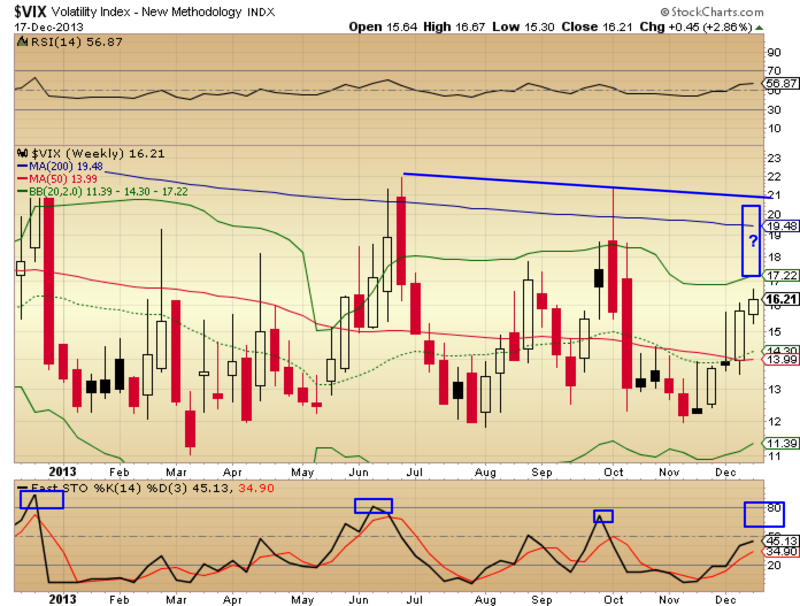 However, on a weekly basis the $VIX still has some potential upside. Frankly such a move as indicated in the chart is a dream short set up. As you can see these type of spikes are very short lived. So where does this leave us: A market set up for a sizable move up with still risk to the downside. Again I do not want to swing short here at all, but rather figure out an entry strategy. Gold: What a bloody mess frankly. While I see a tremendous upside trade opportunity the chart tells me that real downside risk still remains. 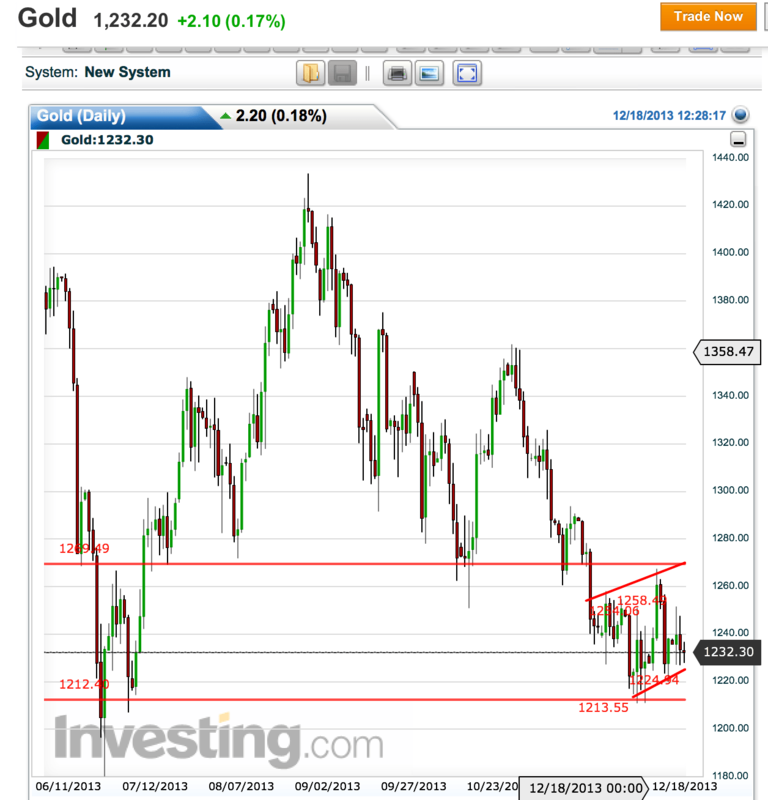 The chart shows a bear flag within a larger H&S pattern that has yet to reach it’s downside target in the lower 1100’s. A break of this bear flag would invite this possibility rather quickly. Yet a move toward the upper part of the bear flag first is also a distinct possibility for a move into the 1270. Tricky frankly. So now the question becomes how to trade all this. The FOMC decision & Ben’s subsequent press conference will bring volatility up and down, we know this. The question is how the market will ultimately interpret this move. My case A scenario is that the market wants to go higher, but may want to flush people out first. A move down to, or even below the Sunday night lows in the $ES are a distinct possibility here. This is my preferred technical scenario frankly as it would likely address my concern areas: CPC & weekly $VIX. We would see spikes in both, further exacerbating the oversold conditions and set us up for a dream long into record POMO and positive seasonality. Case B is an immediate breakout out of the bull flags creating a chase into resistance. I have no way of telling which is more likely and so from a risk management perspective I will not commit large sums of capital until I have a clearer sense of facts & direction. 1. I do want some stake in the upside should case B be the gambit. The way I will play this is not with weekly calls, but with week 4 December calls far out of the money. Basically targets yearly highs, i.e. $181.50 or $182 calls. Rationale: They will be cheapest and I do not have to commit a lot of capital yet they will provide a potential huge return should we just rally up straight from here. The downside is should case A occur they will degrade harshly on a move down initially. So I would not place any stops and frankly they are a 100% risk trade. 2. However, if case A is in play these calls have a good chance to come back and in case B I would layer in a second position of calls, i.e. 177s or 176s (if we trade to these levels) with a larger call position, i.e. double or triple the size of the initial position. In addition to calls in case A I would layer in $ES positions at support levels (i.e. Sunday nights low and 2nd position a bit lower. 3. In case A look for that $VIX spike into the upper weekly Bollinger area. I plan to move into $VIX or $VXX January puts in that case for a nice play on reduced volatility into the holidays. 2. In re: to Gold. As I pointed out I see a possibility to a move to the top of the flag, but the technical picture keeps me out of any play there for now. I will, however entertain going long Gold futures should we see a hard break down out of the flag into the 1100-1160 area. For those wanting Gold before the FOMC a play may be getting January $GLD $119 or $120 calls. I may play this, but I haven’t decided yet.